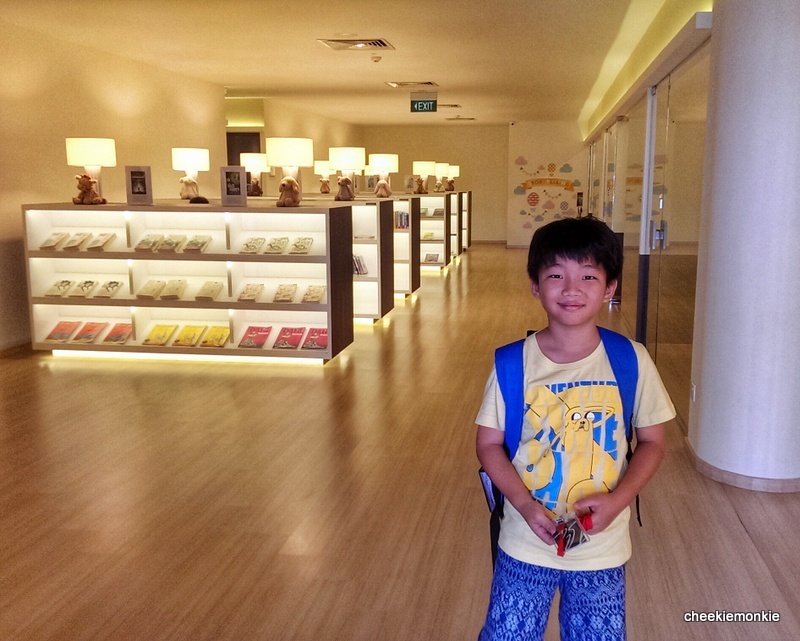 Ash has been attending his English program lessons at The Learning Lab for close to one term now and if you had read my previous post on my first impressions, you will know that he enjoys his weekly sessions... despite initially having reservations. Of course, I was curious to find out just how fun the class session can be so that his interest remains piqued week in week out. So it was a good thing (and an eye-opening one at that!) that I was allowed to sit in briefly during one of his class sessions. The session would see the students - the class is capped to about 10 students by the way, which is optimal for class interaction - attempt a practice test paper which included the dreaded cloze passage. Or least that was what I truly dreaded when I was in Primary School and somehow, those genes must have gotten passed along to Ash now and he is now the one who fears it as well! I know what you are thinking: how interesting can practising a test paper be??? Yes, that was what I thought so too... until Ash's teacher, Miss Siow, played a YouTube video clip in class before the students attempted the cloze passage. Videos always offer a highly more entertaining way to supplement the teaching materials in class so it was no surprise that the students were more receptive to picking up new words and phrases after viewing the video. In this case, the video was about farmers in Mozambique, South Africa, who train huge rats, or HeroRATs, to sniff out unexploded landmines in order to save lives and limbs. Even I found it to be extremely fascinating! I now understand why one of The Learning Lab's strengths lies in its holistic curriculum. Designed to follow MOE requirements closely, yet purposefully pitched 20-30% higher to give students a confident head start in school, the unique curriculum is developed by an internal team of 30 people as current topics are sourced from established publications to equip children with up-to-date knowledge. But the best curriculum can count for nothing if its teachers are not up to mark... especially if they are the type who induces boredom and sleep among the students. Which is why The Learning Lab prides itself on selecting only the brightest and most passionate teachers, who receive a minimum 200 hours of training and are mentored by senior teachers. As the students were put through the practice test, Miss Siow reminded the class that they each have one lifeline to ask her should they require help for any question. Even then, she did not spoonfeed them any answers but instead patiently worked through the questions with each student. And of course, every bit of encouragement from your teacher helps too. Ash's main weakness in the English subject has always been Comprehension and Composition so I was glad that a main chunk of the English program at The Learning Lab was devoted to these 2 aspects. As you can see, there IS a systematic way to answering Comprehension questions competently... which to be honest, will just be another typical puking blood session for me if I were to be the one trying to teach him at home. I love how Ash has been taught the various ways to set a particular scene in his essay by remembering to use his 5 senses. Even better, the students all keep an exercise book where they are encouraged to jot down descriptive phrases and idioms that can be used in their compositions. But perhaps the most blatant way in gauging whether the English program at The Learning Lab had benefited Ash is through his composition test at Term 3 in school. He scored 15 marks out of 20... and his score for his Mid-year exam in Term 2? 12 out of 20. To me, that is a remarkable improvement given that he has long seen composition-writing as an activity that has the same excitement as watching grass grow. His attitude towards essay writing has improved and he does seem more confident in using more phrases in his compositions. So maybe he can take over the writing of this blog soon? Heh. Visit www.thelearninglab.com.sg for more information on its programs.